Minecraft. A game about mining and crafting. You might have heard about it, as many people have. The game has become very popular in a relatively short period of time after the game was developed. Over time, the amount of players grew on Minecraft to the point of establishing a large fan-base. 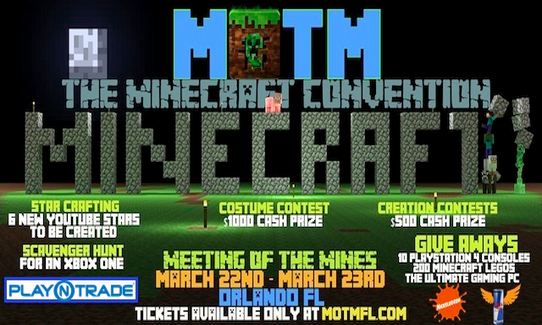 As a matter of fact, there are so many fans of Minecraft, that there are some conventions organized for these fans to come to and enjoy. MineCon, a convention organized by Mojang themselves, is the most known Minecraft convention which has been annually held since 2010. The most recent MineCon, which was held last year, sold 7,500 tickets. It was an expensive convention though, as the tickets sold at 150 US Dollars apiece. Because this price is a fairly great sum, some fans were not able to afford to attend the convention. Subsequently, some people decided to host their own 3rd party Minecraft conventions. There are lots of instances where all went well and there was no trouble in these 3rd party conventions. However, as the Minecraft fan base has grown so big, there’s bound to be conventions that have bad intentions: to scam the people trying to attend a fun Minecraft convention. This is what happened the Sunday of last week in Orlando, Florida. The whole plan for the fiasco began last year, when an individual named Kevin Roman took the initiative to organize his own Minecraft convention that would be called "Meeting of the Mines." This convention turned out to be quite a hustle, as the attendees of his convention, found out rather quickly. The issues started when the Meeting of the Mines staff started selling tickets last year for the event that was supposed to be held in December 2013, but got pushed back to March 2014 because of issues that supposedly made it impossible to hold the convention. At this time, 1024 tickets were sold, which amounted to an estimated total of 51,200 US Dollars. On March 23rd, the convention was scheduled to start at 12 o’ clock, but was delayed, for some unknown reason, to 12.20PM. After that time, the convention ran for only 2 hours. After those 2 hours, the convention got shut down due to the whole convention getting out of hand. The staff, at this time, were telling people that they would get a refund, however, such a refund was never received by the attendees. Spoiler: The original advertisement from 2013, Big Time Rush at a Minecraft convention?! The convention advertised to give away Playstation 4s, Xbox Ones, an Alienware Computer and other goodies. Those behind the convention claimed to be sponsored by brands such as Nickelodeon and Redbull, which was completely false. The advertised items were never seen nor were they given away, apart from one (1) Playstation 4. Instead, what the MOTM staff gave away includes (empty) MOTM bags, boxes of pens (not joking) and vouchers for masseuses. People attending the organized contests, including a costume contest, did receive their prize (a check of 1,000 US Dollars), but the prize turned out to be nothing of value after their check bounced on them. The attendees were very disappointed as soon as they entered the convention as it turned out that the venue rented by the MOTM staff wasn’t at all what they expected. The venue supposedly had concrete floors and plain white sheets as a cover for the walls. There were a few Minecraft-related props, but they ranged from cut-out cardboard Minecraft animals to bags with Creeper faces (a Minecraft hostile mob) on them. Spoiler: Click to see some of these supposed 'props'. Spoiler: Click to see the poor lighting and wall 'decoration'. After the disaster that was MOTM, attendees were enraged and wanted their money back. However, most attendees would have difficulties in getting a refund. The attendees that purchased tickets via credit cards supposedly got their money refunded, but those who purchased tickets via PayPal don’t seem to be able to get a refund. This is due to the policy of PayPal that the customer can only dispute a transaction if the transaction was made within a 31-day range. Since the tickets were sold last year, these attendees can’t dispute their transaction anymore. PayPal are, however, investigating this scam, according to PayPal’s reactions on their Facebook page. At this point, it is unknown whether the attendees who bought their tickets using PayPal can get a refund. So, what now? I have tweeted Mojang’s Dinnerbone about what’ll happen next, and he stated that “they will be setting some requirements which should filter out scammy conventions.” I am sure this’ll filter these scamming conventions from the legitimate ones a bit, but I don’t think they’ll be able to completely filter them out. Different forms of media are also taking interest in this scam. For example, News 12 Long Island reported this issue on March 26th. I have included their article as a source below if you are interested in that. Recently, the organizer of MOTM, Kevin Roman, responded to the accusations he received. If you are interested, you can read his official statement here: http://pastebin.com/qn4WFv8d. So, what do you think about this? Do you have anything to add to this article? Please comment below!